It should look like this when screwed together, with the slight cut-out at the top. See E3D-v6_Assembly#HotSide for the assembly instructions. Volcano uses the same thermistor, Heater Cartridge, fixings methods and procedures as E3D-v6 hotends. As such assembly of Volcano is essentially identical to that of the standard E3D-v6 block, the only notable difference is that there are two heater clamping screws, and the heater wires should exit through the top of the block. Please follow the instructions to the letter! Note that (in my experience) the heater cartridge length varies a little so if you have spares you may want to experiment to see which fits the best. Do not forget that Volcano is 8.5mm longer than v6 This means that you will need to adjust your Z limit switch, or your software Z offset numbers to accommodate this. Not doing so is likely to result in a fairly unpleasant Z-crash of the nozzle into the bed. Volcano is designed to melt filament at a much higher rate than the standard E3D-v6 setup. This allows the use of larger diameter nozzles and higher layer heights. Broadly speaking, printing with Volcano is pretty easy. You just need to ensure that you've setup your slicer to use the correct nozzle diameter, and set a larger layer height. 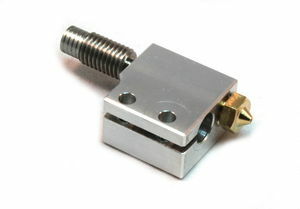 We would recommend starting out with the default 0.80mm nozzle, with 0.60mm layer heights. This makes for objects that are extremely strong, print quickly, and still look great. We have found that Slic3r http://slic3r.org/ seems to cope better with the creation of these large extrusion widths than other slicers.